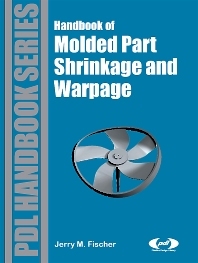 The handbook explains in plain terms why moldings shrink and warp, shows how additives and reinforcements change the picture, sets out the effect of molding process conditions, and tells why you never can have a single ""correct"" shrinkage value. But that's not all. The handbook shows how to alleviate the problem by careful design of the molded part and the mold and by proper material selection. It also examines computer-aided methods of forecasting shrinkage and warpage. And most important of all, the handbook gives you the data you need to work with. This is the most complete collection of shrinkage data ever made and includes an extensive compilation of hard-to-find multi-point information on how processing, part design, mold design, material and post mold treatment affect the part's final dimensions. Manufacturers' figures for thousands of grades, along with an exhaustive search of magazines, journals, conference papers, books, web sites and brochures combine to make this a powerful resource. A lot depends on a dimensionally correct molding. Quality, speed to market, profit margins for the molder and toolmaker, the efficiency of secondary and assembly operations, reputation; all these are on the line. The Mold Shrinkage and Warpage Handbook is the book for people who have to live with shrinkage and warpage. It is the only book for people who have to commit themselves. Plastics engineers, technicians, and scientists in injection molding facilities.